Life is Feudal • View topic - Development News #78 — OBT is upon us! Development News #78 — OBT is upon us! The OBT of Life is feudal: MMO is right around the corner! The lucky ones, who got themselves Zealous believer packs - as well as our beloved Alpha testers - are already able to enter the MMO worlds. (Don't be afraid, though, they are not allowed to claim land before anyone else). However, due to an unforeseen bug that made it possible for some players to get GM powers (shame on those who abused the bug! ), we had to wipe the worlds after only a few hours of early access. More detail here. 17th of November 2017 at 09:00 (UTC) (4:00 am (EST) / 1:00 am (PST) / 12:00 (MSK)) - Zealous Believer pack owners get an early access to the world. Devoted Believer pack owners will get an early access to the world. 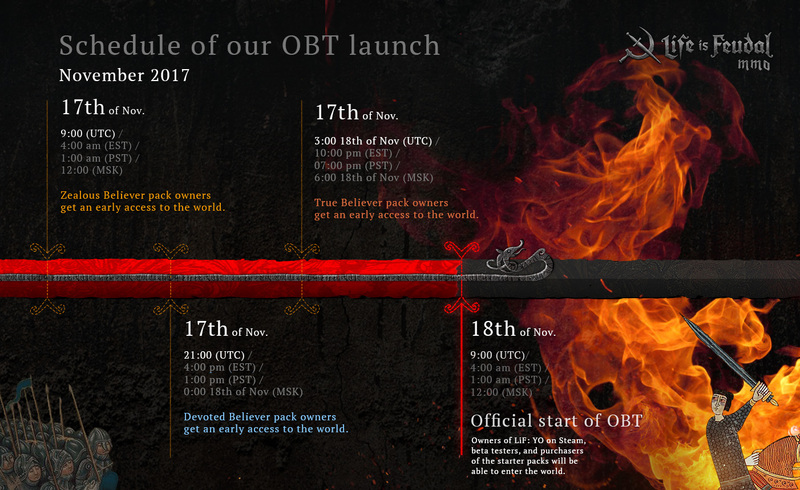 The official start of OBT and Owners of LiF:YO on Steam, beta testers, and purchasers of the starter packs will be able to enter the world. For the owners of LiF:YO, we would like to draw special attention to the fact that, due to Steam's policy, we are not able to launch LiF:MMO in early access directly on Steam this upcoming weekend. However, you are able to register your account at www.lifeisfeudal.com and download the LiF:MMO launcher directly from our website using a special button on the ‘your account details’ page (check out this guide on downloading the MMO launcher). You then need to LOG IN to the launcher USING YOUR STEAM ACCOUNT that has Life is feudal: Your Own in its library. After that, you will be able to enter the world at the abovementioned date and time and will have a ticket to Abella in your in-game shop inventory (you can access it by pressing Esc -> Shop -> Inventory). We put together a little guide to help you redeem the ticket. Life is Feudal: MMO will be automatically added to your Steam library at a later date, as soon as it is possible! Thank you for being awesome and patient while we were figuring this out! Re: Development News #78 — OBT is upon us! Last edited by Khan- on 17 Nov 2017, 19:51, edited 1 time in total. Last edited by Saar on 17 Nov 2017, 17:27, edited 1 time in total. Stop putting out new updates and actually help the YO people download the game. Last edited by Riptose on 17 Nov 2017, 17:36, edited 1 time in total. mmo still down for how long? This make no sense! How does OBT start at 4am EST on the 18th but True Believer EA starts at 10pm EST on the 18th...last I knew the morning is before night time in which True Believers get late access??? Bad enough my time and vacation hours got wasted for some BS and yet lets compensate them and forget everyone else. What are you guys doing over there!? i dont have download button anywhere ? "However, you are able to register your account at http://www.lifeisfeudal.com and download the LiF:MMO launcher directly from our website using a special button on the ‘your account details’ page (check out this guide on downloading the MMO launcher)"
There is no special button on my account details page or dashboard. I'm logged in, YO ownership is verified, but the download button is not there. Don't worry it's 10:00 pm EST on the 17th. They messed up when they typed it. So you're saying its a typo? A bloody TYPO!? Best hope thats the case because is some complete BS! WHY am I wasting my time on the forums instead of playing an MMO I was suppose to be in almost 3 hours ago...Fine, I realize the Golden privileged guys messed it all up and had to wipe but come on already. This wording seems to suggest people who don't own YO, or have beta access wont be able to enter the world at all. Does this mean Zealous Believers wont be able to trade extra tickets to people whom don't otherwise have access to the MMO already? Otherwise should the wording not be that they would "receive their free tickets" on the 18th, and everybody should be able to access the world? Still waiting for the maintenance which should have finished at 18 o'clock ... Another 1 hour lost! Last edited by Harold on 17 Nov 2017, 18:19, edited 1 time in total. So, we still cant download the game until 4 am?? I downloaded the launcher, but it is not downloading the game, still just has the buy button even though i signed in through steam like you suggested. you really need to let people pre download so that it doesnt crash your servers when everyone is trying to download at the same time. Especially now that we wont be abl to download through steam this weekend. Steam servers are made to handle heavy download volumes, i doubt people will be able to download the game from your servers very fast. There was a typo for True Believers. It's 17th of Nov, and 6:00am 18th of Nov for MSK. Fixed in the text and the graph. Not sure how this is an update, when nothing has changed since yesterday that I can glean. Why is the launcher still not fixed? Why are people being fobbed off to an automated reply support bot at Xsolla for a solution? Hollygrzedzicki wrote: Why are people being fobbed off to an automated reply support bot at Xsolla for a solution? Because it's Xsolla that deals with launcher, logging in and pack issues. Arrakis wrote: There was a typo for True Believers. It's 17th of Nov, and 6:00am 18th of Nov for MSK. Fixed in the text and the graph. If you're going to have a significant change in initial access times, you need to send out another email alerting people to this, not get them hyped up to have the client refuse access to the world and then consequently have to figure out wtf went wrong. Clean it up guys. True Believer EA starts at 3am UTC of the 18th, that's what it's written. Why don't you invest 5 minutes of your life to learn something useful like what is UTC instead of writing nonsense? That way you MIGHT understand what 10pm EST actually mean. Arrakis wrote: However, you are able to register your account at www.lifeisfeudal.com and download the LiF:MMO launcher directly from our website using a special button on the ‘your account details’ page (check out this guide on downloading the MMO launcher). That guide is a joke. There is no such button as the one shown and we still cannot download the game. The launcher itself manages to crash 90% of the times without even doing anything since for some "unexplicable" reason you won't let players download the game before they have access to the world. I can't imagine how well will this launcher perform when it will actually have something to do.